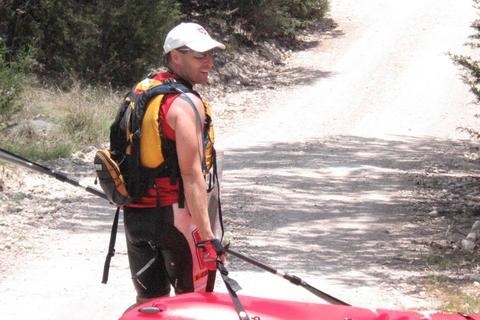 This is my last race before final packing for Primal Quest 2006 (racing as Sutliff Hummer). This race looked to be a good short prep race for PQ. It had many of the training elements that I needed to practice at: rocky dry terrain, technical mountain biking, ropes, a hot climate, some swimming, and lots of contours to navigate from. The team that joined me for this one consisted of Jeff Diamond, Kipley Fiebig, and Julie Standing (Julie will also be racing with me at PQ). Camp Eagle is an oasis in the middle of nowhere. It was an 11 hour drive for me from New Orleans to get to the race site. I picked up Jeff and Julie along the way and we met Kip there the night before the race. Normally, Kip or I like to go out and pre-scout the course, but due to time, distance and the race not allowing outside maps, we did not get any chance to scout this place. I bet not many other teams did either due to the remoteness of the place. Southwest Texas is a pretty sparsely populated place. Interstate 10 runs through there but there is not much along lots of that stretch of highway. We exited the interstate then drove about 50 miles farther out to nowhere. We were all a bit worried about this location, but it was a scenic drive to the race site. We actually saw a wild pig and all her babies playing in a mud hole right next to the winding gravel road to the camp. After driving down what seemed to be a very long gravel road, we arrived at Camp Eagle (www.campeagle.org). Out here in the middle of seemingly nothing was a very cool looking place. Kip had arrived first and claimed a transition area under a tree. Everyone seemed to have plenty of TA space, so we set up my canopy and went for a walk around the camp. We decided to not camp in tents, although the weather was nice outside at night. Instead we rented some beds from the camp in an air conditioned dorm room, thanks Sarah (Camp Eagle is a Christian camp for kids). We got checked in and then enjoyed some burgers provided by the race staff. Race start was 8 am with a 7:30 pre-race briefing. A river (sort of) runs in front of the camp and is the real central area of this area. The water is crystal clear with lots of water based activities. It is sort of a river, but more like a series of lakes as the river is dammed up in several spots to create more of a lake near the camp. There were all kinds of cool looking giant water toys floating around, which I was sure we would get a chance to play with at some point during the race (or hoped to, since it gets real hot in the afternoon). Most all of the top Texas (and Louisiana) teams were represented at the race. There were several teams that could have easily won this race. Race morning was pretty easy as we were all set up. At pre-race, we were given maps and passports, but no UTM's. We were told we all had to show up at the starting line with nothing but PFD's as gear. The race would start with a short run to the river just upstream of the main camp. 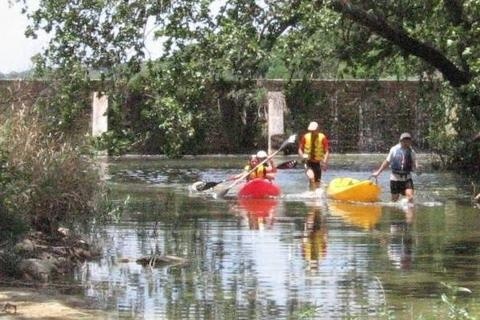 We would then have to wade, swim, run down the river to a line of kayaks which were tied across the width of the river. Each team was to untie one boat and proceed downriver around a platform, then back upriver to a take out point. All team members had to touch the boat at all times (no tow lines, no fins, etc.). Backpacker got to the boats first and we were off, just swimming along. A team of 2 guys flew past us as they were on the boat, paddling with hands. We quickly adapted that technique, although it was tricky getting 4 people on a 2 man sit on top kayak (only 2 person sit on tops were permitted in this race, so no bringing fast boats to this one). A couple of 2 man teams beat us out of the water as they were much more efficient paddling with hands. It was then a quick run up the hill to the main camp and get our instructions for leg 1 of the real race. Leg 1: It was an opening mountain bike leg. The camp has recently cut lots of very cool looking single track trail. We were given UTM's and a trail map, but the clues told us that each CP was on a trail and the name of that trail. The easy thing to do would have been to transition real fast and hit the trails (they were all well labeled). We decided to plot the points on our topos (the trails were not on them). The trail map was typical, hand drawn map not to scale, but it did show a few jeep trails that were on our topos. We decided to try and cross reference that info so we could jump into and out of the trails on the roads where possible. The strategy seemed to help us out. We were even the first team out of transition (we generally transition quickly). On the way out I saw Team Werewolves and Beth told me they would be catching us soon. We are not a power mountain biking team (well one of us at least). The first point was easy, just follow a trail, cross over the river and pick it up. As we were crossing the river on the way back, several teams were heading down hot on our heals. This area has lots of fords across the river, so we expected to be wet all day long crossing back and forth (we were correct). Next up, was some harder trails and we chose to take a jeep road to cut some of the single track. We got all the bike points and were first back to main transition to start our next leg. Leg 2: Next up was a snorkelteering leg - just as it sounds, swim around and find some points based on a map, well pictures really. This was the leg I knew I would really have to help out on. Kip does not like these kind of legs. We grabbed PFD's, swim fins, and goggles and ran to the swim site. Here, we were given pictures of 4 locations on the opposite shoreline of the river. At the bottom of those locations there were words written on milk jugs, we were to swim over, dive down, get the word and swim back. This had to be done one person at a time. Kip panicked a little, but we got it done and were able get out of there before any other teams arrived (maybe he even liked the leg this time). As we were heading back into transition, another team was heading to the snorkel leg, I think it was Heart Hammer. Next up, Leg 3 - trekking and ropes. We had 5 trekking points to plot and find, the 6th point was the start of the ropes course. We plotted points, packed our ropes gear and headed out. The first point was called "mine shaft" in the hints, and there we found a wooden platform and some volunteers (all the camp volunteers, mostly teens, were incredibly friendly and happy to be out there!). We were told we had to get all 4 team members up on the platform through a hole in the bottom of the platform without touching the sides. The only problem was that the hole was about 8' off the ground. We lifted each other up and got it done. The next point was on top of a large hill (mountain to people from Louisiana), at a windmill. This was a functioning windmill which pumped water and filled a large retention tank about 4' deep. The CP was in the middle of the tank, so since I was willing to sacrifice for my team, I jumped in the tank (of nice cool water) and punched the CP. The next few points involved some trekking and cross country navigation which was quite fun in this area. The final point was the start of the ropes course. We were the first team to arrive. There were several options here. There were 2 rappel courses, one long, and one short. The short one was faster, but required a little more running to get to it. The next option was self belay or have the staff belay us. With all the required safeties, the staff told us that staff belay would be faster. It is a race, so we opted for speed, not fun. We took the short rappel and the staff belay. Too bad we carried all our own gear for the whole trek before. After belaying down, there was a sherpa-line for us to clip into. This is a steel cable anchored into the cliff that we could follow most of the way back to reach a safe point to go back up the cliff to return to the ropes start. We all made it down fine and back to the ropes start before anyone else started. This pumped us up as it meant a 20 minute lead this early in a race. From there we had to run back to main transition for the next leg. After the race was over the staff asked us why we took such a long way back to transition. Apparently there was a path (with a sign) showing a fast way back to main transition. We did not see it so we took a long way around and back to transition. Leg 4 is where the real fun began. This leg was called "water sports". The camp has several large water toys that we got to go experience. 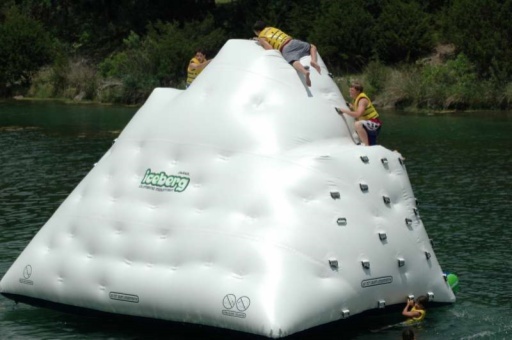 The first was called the Texas Iceberg. This was a large inflated "iceberg" with handles on it. The CP marker was at the top. All team members had wristbands so we all had to get up. It was not easy getting started with this task. We swam out with our shoes on, and those were not going to fit in the handles, so we swam back, dropped our shoes and started over. Going up was hard, but jumping off to come down was sure fun. The water here was crystal clear and very cool (it was already rather hot outside). Next up was climbing up on top of another platform for a punch point and then back to main transition. A short leg, but very fun and refreshing. Leg 5 was a bike leg south on a rock road (I said rock, not gravel). This was in rolling hills, but at the bottom of each hill was a river ford. This was nice and refreshing, but very tricky as the pavement of the ford was super slick. We had a few wipeouts on the first one and were much more careful after that. We later witnessed a few other teams sliding down on the same ford. The road was pretty rough and not generally intended for much car travel. This was an out and back trip on the same road. At the end of the road we were to find one checkpoint. The wildlife around here has minimal fear of humans. We rode along side several deer for several miles. As we approached, they would run back and forth across the road ahead of us, and then stop, only to do it again when we approached. The clue for the point location was river bank. We jumped off the bikes, into the river and could not find this point. We were so eager to get looking that we walked right past the point. After 5 minutes, we went back to where the ford crossed the river and the marker was right there (well sort of under a tree - that's our excuse!). On the way back, we passed Werewolves so we knew we could not let up now with those strong bikers not far behind. Leg 6 was a paddle/portage leg. The points were both north and south of the main camp. We chose north first. It involved portaging over a couple of dams and over a road or two. Every dam was work, but it was nice to get back into the cool water for a few moments to cool off. The water in this river was spectacular. It was nice and cool and so clear. As we paddled, we could watch fish below the surface swimming all over the place. The northern point was easy to find so we got it and headed back south. 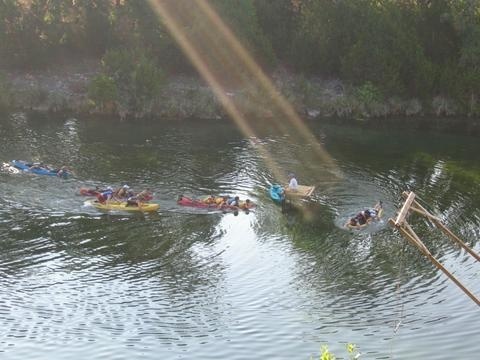 As we paddled past the main transition, we could see teams on the water toys having a good time. We were told after the race that several teams just stayed and played on the water toys for a while during the race. The southern trip on the river was lots more work. The dams were taller in a few spots and we had a long portage where the river was dry. The river was also below the rappel section so we could see teams up on the cliffs having their fun on the ropes. We punched both the southern CP's and headed back up river (to the long portage again). At some point we passed team Werewolves again. We did not know how far behind they were as we did not know if they went north or south first to get paddle points (it was up to the team). Leg 8 - the final hot trek. It was going to be a bit longer than our first trek and it was much, much hotter outside now. The sun was shining very bright and not a lot of wind. We plotted points, packed lots of fluids and headed out. We figured trekking was our strongest discipline and we should have about a 30 minute lead going into this leg. With the heat and slow terrain we figured as long as we did not get lost, we had a good chance of holding off the chasing teams. Kip nailed all the points dead on. We went right to each one of them, punched it and headed out. We did get to pass that windmill during this leg, to my delight, as we all got to refresh in the cool water (Jeff went swimming in it). This leg was also a rogaine leg which allowed us to get points in any order. At our last point, we heard noises in the woods, Jeff still swears he saw some deer, but it turned out to be a team (Heart Hammer) coming for the point. It was their first point as they picked the opposite order from us. We took some easy roads back to the finish line. 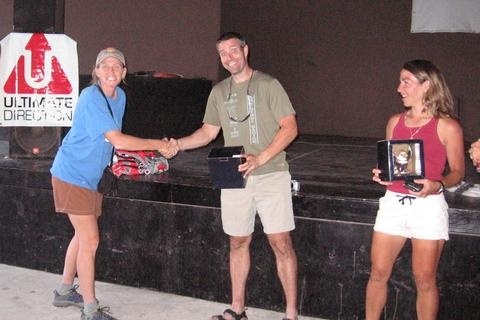 We were able to maintain the gap and took the victory at the first Adventure Race at this truly great location. Many thanks to Art Cook, Robyn Cantor, and Camp Eagle for a great race. 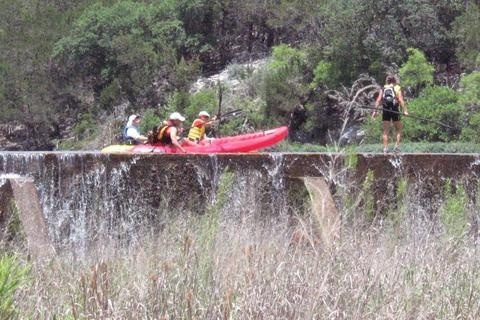 The excellent use of the water kept our team refreshed enough to keep moving in the heat. 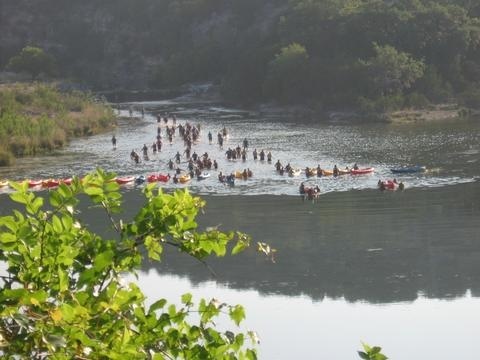 Had there not been all the trips to the water, this would have been one hot death march of a race. This location should be able to provide many more future races as there is lots of terrain out there that we did not cover during this race. Those of you who know me, know that I love to (over-) analyze things. In that tradition, I did some examination of the split times for the Too Cool "Spread Your Wings" race legs. This chart shows how long it took each of the top six teams to finish each of the legs. The fastest times for each leg are highlighted in cyan, and the slowest times are in yellow. Why consider only the top six teams instead of all 27? Because I'm too lazy to do the math for every single team! Duh! Not much to say about the opening run/wade/kayak sans paddles. We all took about the same amount of time to finish this special test, with Backpacker and Werewolves coming in slightly ahead of the rest. The snorkel was another leg where everyone took about the same amount of time. Even teams that had a whiny crybaby with them that wasted precious minutes complaining about how the test should have been setup differently (I'm referring to myself, here!). The first trek leg was another good leg for Backpacker. We hit all the points dead on, took good routes, and were able to jog all the open areas. We also were very efficient and fast on the ropes. We were originally going to self-belay, but we talked to the guys up top and they convinced us that they could belay us down quickly, so we opted to do that so we wouldn't have to mess with the prussics. It worked out well, as they sent us over the edge quite fast. We opted to run the extra distance to do the shorter (and hopefully faster) rappel. We overlooked the fastest direct trail route back to the TA from the ropes, but even so, still cleared the leg 12 minutes faster than the next fastest team, Werewolves. This leg was also where Phat Free first passed Peanut Butter, STAR passed HART/Hammer, and Werewolves climbed all the way back into second place overall. The iceberg water leg was yet another leg with equal times. Though this was Peanut Butter's time to shine, as they showed us all up by at least a minute. They must have figured out the "you can't climb the iceberg with your shoes on" problem faster than the rest of us did. The second bike I really expected us to get creamed, as the nav was easy, and I'm not a good biker. Sure enough, Werewolves took the leg, with HART/Hammer only a minute slower. Though it should be noted that our team wasn't all that slow, in fact, most of the discrepancy can be accounted for the fact that we spent about five minutes looking for the checkpoint, as we walked right by it without seeing it (D'oh! I thought the nav was supposed to be easy!). Also, Dave towing me on the open roads helped out our speed immensely (thanks, Dave!). 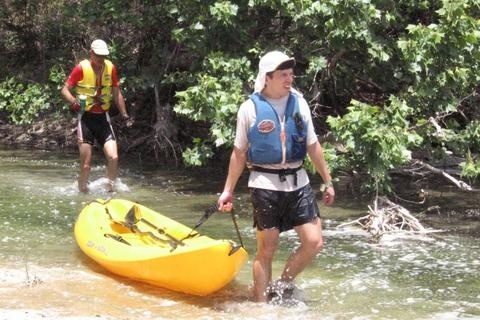 I didn't expect us to lead the paddle, as Jeff and I couldn't paddle or portage all that impressively. And Werewolves blew by us on the boats (on the out and back) so fast that I thought their wake was going to capsize us. But, to my surprise, we actually were the fastest on the paddle leg, finishing seven minutes faster than Werewolves. Whadaya know. Maybe it was because we threw out boats over the biggest dam (on the way down), instead of portaging around it. For the most part, this leg was a wash, as everyone took about the same amount of time. The exception would be Phat Free, who took significantly longer than the rest of us. I understand it was all the damn dam portaging that was hurting them. This allowed their arch-nemesis, Peanut Butter, to pass them again on this leg. The zip line was still another leg with relatively equal times, with STAR and Werewolves edging out the rest of us by at least two minutes. The final trek was the moment of truth for a lot of us. Phat Free aced this difficult leg, finishing ten minutes faster than the next closest team (us), and passing Peanut Butter for the final time to take fifth place. Werewolves, having been racing strong and right on our heals all day long, finally broke down on this leg, and fell from second place to fourth. Revisiting Phat Free's troubles with the paddling leg: The top six teams all had paddle times in the 1:32-1:47 range, except for Phat Free, who took 2:42. If instead Phat Free had done the paddle in 1:45, they would have finished the race in SECOND place overall, instead of fifth! Even a 2:05 paddle would have been good enough to move them up to third place overall. Truly, this evil leg hurt them mightily! It's highly likely that they would have come in second place, if only there were no portages! A very fun race! It was great to see so many competitive teams show up for this one, and push each other to go faster!